As a state college of the University System of Georgia, the College of Coastal Georgia will be a college of choice for residents of Georgia and beyond by providing an accessible and affordable quality education. Advocating excellence in scholarship and community engagement, the College promotes student progression and timely graduation through student-centered programs that offer a rich and diverse student experience. Students are prepared for meaningful careers, advanced study, lifelong learning, and participation in a global and technological society. The institution will provide associate and baccalaureate degrees that support the intellectual, economic and cultural needs of the community and region. This mission statement is fully aligned with the University System of Georgia’s (USG) mission, it represents the core principles and unique institutional characteristics of a state college, and it is accentuated by strong leadership, worthwhile community linkages, and exemplary student development. Further, the new mission statement effectively infuses the College’s strategic framework that is structured around five central themes: Student Enrichment, Academic Excellence, Institutional Distinction, Leadership through Community Engagement & Partnerships, and Sustainability & Organizational Development. And, finally, the revised mission underscores the College’s sustained commitment to community engagement that encompasses service-learning, volunteerism, practica, and internships, contributing to the cultural, economic and social well-being of the local community, southeast Georgia and beyond. The College of Coastal Georgia experienced 3.8% and 3.6% increases in its fall 2017 enrollment and FTE, respectively, with an enrollment of 3,663 students and FTE of 3,078. In terms of self-declared race/ethnicity, 6.0% identified as Hispanic/Latino, 0.3% American Indian or Alaska Native, 2.0% Asian, 18.8% Black or African American, 0.2% Native Hawaiian or Other Pacific Islander, 66.5% White, 4.1% two or more races, and 2.1% undeclared. With an average age of 23.4, the College’s student body is composed of 66.6% female and 60.5% full-time students with 82.2% indicating Georgia residency, 19.8% out-of-state, and 1.9% out-of-country. First-generation students (whose parent(s)/legal guardian(s) have not completed a baccalaureate degree) account for 65.3% of the total student body, while adult learners (25 years of age or older) and military/veterans account for 24.7% and 17.2%, respectively. Pell recipients account for 32.7% of students, while Move on When Ready (dual-enrolled) students total 418, or a 37.5% increase compared to fall 2016. Over the past five years, the College has built the needed structure to expand the incoming freshman class while maintaining retention. Looking ahead, continued growth calls for an active institutional engagement in completion efforts in order to appropriately serve the student body. CCGA’s institutional mission is a beacon that guides its completion priorities. First, by providing access and affordability, CCGA addresses the needs of the region and is particularly impactful for communities that are traditionally underserved in postsecondary education. Secondly, the College promotes student progression and timely graduation by expanding and improving retention systems and instructional delivery to support student success. Finally, by increasing student campus and community engagement, the institution prepares students to engage in meaningful careers and to satisfy the economic and cultural needs of the community and the region. Leading and supporting the completion efforts at the institution, the Complete College CCGA Task Force was instituted with a charge to evaluate, identify, implement, and monitor high-impact strategies and activities that increase retention, progression and graduation rates. This task force is comprised of leaders from a diverse group of units across the institution, who work collaboratively and strategically to guide the institution while maintaining an alignment of the institutional goals and strategies with the college completion plan of the state. The next section is a retrospective review of the work completed in the 2016-2017 academic year, and describes in detail a few selected strategies from the many institutional endeavors that support college completion. Celebration of important educational milestones in the student lifecycle. This high impact strategy is clearly aligned with CCG’s overall goal of increasing the number of undergraduate degrees awarded by USG institutions and highlights progression and success for all students. It also aligns with the CCG goal of increasing the number of degrees that are earned “on time” (associate degrees in 2 years, bachelor’s degrees in 4 years). Beyond the connection with CCG’s goals, the strategies selected for update form part of the institutional strategic plan and most of them align with Institutional Goal A1: Enhance opportunities for student engagement by providing an educational, inclusive and socially responsible learning community within the College and beyond. This important initiative is meant to signify and celebrate important time periods in the lifecycle of a college student, particularly students that initially intend to complete a baccalaureate degree. Creating and encouraging the completion of milestone markers (i.e., one-year Certificate, Associate degree) has the potential to encourage students to continue on and provide a tangible credential in case they discontinue their studies prior to completing a baccalaureate degree. The Mariner Milestone Initiative is an ongoing strategy that continues to identify students that are eligible to receive associate degrees. After thorough audits of students with 60 or more credits, this initiative awarded 85 associate degrees to students that would not have otherwise applied for one. The main measure of success for this initiative is the number of associate degrees awarded to students that are in baccalaureate programs. The students targeted by this initiative are students that are eligible to receive a degree but do not apply for one; as such, the baseline before instituting this initiative would have been zero, given that these students were not planning to receive an associate degree. The number of degrees awarded by this initiative is a good interim measure of success, with 33 degrees awarded during summer 2016, 39 awarded during fall 2017 and 29 awarded during spring 2017. Beyond the increase in the number of associate degrees awarded, the Mariner Milestone initiative is aimed at rewarding progression by giving the students something tangible that reflects their accomplishments, while at the same time promoting retention. While the comparison above refers to additional degrees conferred to a population of students that are not applying for one, the change in the graduation rate of the first-time full-time freshman cohorts is a good indicator of the impact of this strategy. 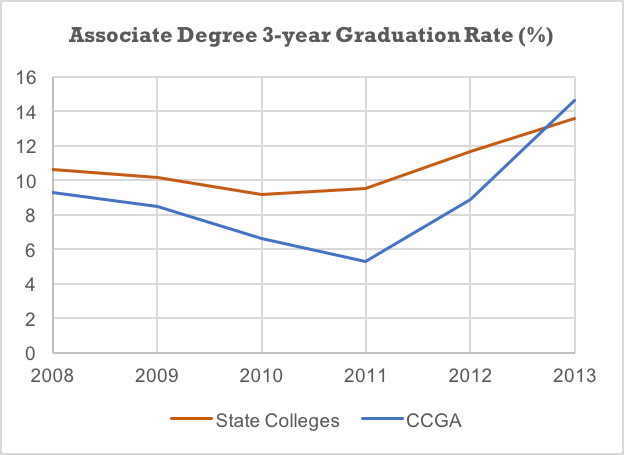 The graph below compares the Associate Degree graduation rates (based on 150% time to degree) at all USG State Colleges and at CCGA. The data above clearly indicates a substantial improvement of the graduation rates for the 2012 and 2013 cohorts (note that the 150% time to degree for the 2013 cohort concluded during the 2016-2017 academic year). From a trailing graduation rate when compared to other state colleges from 2008 through 2011, to a graduation rate for the 2013 cohort of 14.6%, the institution has now surpassed the graduation rate of state colleges. As the College performs additional thorough degree audits, this presents an increased level of administrative upkeep. The institution is now evaluating the process to award a Liberal Arts first-year certificate and a STEM (Science, Technology, Engineering and Mathematics) first-year certificate, and we need to identify an audit and award process that will be effective, efficient, and sustainable. Increase access and completion for adult learners. While aligned with the overall goal of increasing the number of undergraduate degrees awarded by USG institutions, this strategy focuses on the first CCG’s access goal of increasing access for underserved and/or priority communities, and aligns with Institutional Goal A1. To encourage greater access, post-secondary participation, and baccalaureate degree attainment, the College of Coastal Georgia has created two streamlined pathways of access to ease admission and the transition to entering a degree program. These pathways are designed for all students who have graduated high school or earned a GED but have little or no prior college experience and/or are returning to college after being away several years. The College of Coastal Georgia is committed to reducing the hurdles for students, particularly those that have self-efficacy and test anxiety by streamlining and simplifying the admissions process and assisting students to overcome initial testing hurdles. By creating a short application process and basing Mathematics and Reading/Writing placement on classroom achievement, one-on-one advising, and guided choice, students can build their self-efficacy and academic confidence to eventually lead to degree attainment and success. The College established a personalized enrollment pathway for adult learners. Each student now jointly works with his/her admissions counselor and academic advisor to develop an enrollment pathway. This enrollment plan begins with a counseling session with an adult learner admissions counselor that outlines possible pathways to establish successful academic and financial plans. The student finishes the enrollment process by a meeting with the academic advisor to work on placement and the first-semester schedule. While the Adult Learner Pathway is in its infancy, a preliminary metric associated with access for this traditionally underserved population is the enrollment yield for non-traditional age students (25 and older). Based on the data for fall 2013, 2014, and 2015 the enrollment yield for this group was 30.3%. The development of this new Adult Learner Pathway has resulted in a substantial increase in registered adult learners. For fall 2016 the enrollment yield increased to 36.1%, the number of registered students increased from 29 to 52, a 79.3% increase from fall 2015. The work from this initiative during the 2016-2017 year continues to improve access for this population, and for fall 2017 the yield increased to 38.3%; with 70 students registered, this represents a 141% increase when compared to fall 2015. New approaches and pilots will often result in the disruption of long-established traditions and protocols of advising. The College is already experiencing the implications of the new pathways on enrollment trends and now it needs to monitor carefully the efficacy of the pathway and how well students are progressing through the gateway courses. The success rate of these students in corequisite support courses is currently being evaluated. This strategy aligns with CCG’s goal to decrease excess credits earned on the path to getting a degree, with the goal to provide intrusive advising to keep students on track to graduate, and aligns with Institutional Goal A1. After a thorough evaluation of our academic advising structure, which included the evaluation of feedback from faculty, staff and students, the evaluation of the Regents Advisory Committee on Academic Advising Survey, and following best practices across the nation, the College transformed the academic advising model for the 2016-2017 academic year. In the new model, the College has shifted first-year advising to be handled by the Center for Academic Advising using first-year professional advisors. The first-year professional advisors, assigned to specific departments and/or majors, help students complete a four-year academic plan, monitor student’s academic performance, provide direct advising when registering and assist in major selection, seek individualized services as needed, and encourage students to engage in the CCGA community. As students dive deeper into the content area, and after reaching 30 credits, academic advising transitions to the academic department (faculty advisor). This dual model of advising provides important quality contact with students to help them connect with their classes, their program of study, their faculty, and their end goal for jobs and career. The implementation of this new academic advising model aligns well with CCG’s Persistence & Progression goals, and aligns with the institutional commitment to improve retention, progression and graduation rates. As this first phase of restructuring addresses first-year students, the College will use the first-year retention rate (IPEDS definition) as one of the metrics for evaluation. With a baseline measure of first-time full-time freshmen retention of 55.6% from fall 2015 to fall 2016, the institution will continuously evaluate this metric to see the impact on this population. The feedback collected from previous hybrid and decentralized models of academic advising indicated the need to improve consistency and accountability. The variety of advising models that were being used throughout the different schools at the College resulted in a marked inequity in the distribution of workload and most importantly a lack of consistency and advisor availability experienced by the students. The new model was implemented during the 2016-2017 year and while the structure, consistency and accountability of advising have improved, preliminary results do not indicate an increase in retention rates yet. Retention is a multidimensional issue, and the institution will continue to evaluate the different initiatives through the Complete College CCGA Task Force. Increase Dual Enrollment student outreach to local county school districts. This strategy is directly aligned with CCG’s access goal to shorten time to degree completion through programs that allow students to earn college credit while still in high school, and aligns with Institutional Goal A1. The College continues to strengthen its Dual Enrollment program, and with its outreach efforts during the 2016-2017 year, the enrollment reached an all-time high of 418 students for fall 2017. The program’s administrative oversight is now handled by the Lead Academic Advisor, and the institution has a designated Dual Enrollment Advisor. CCGA continues to expand and enhance the relationship development with high school counselors, locally, regionally and state‐wide. The institution now hosts annual Dual Enrollment breakfasts for all area high school counselors that include Glynn, McIntosh, Camden, Wayne, Brantley County school systems as well as area private high schools. The strengthening of the bonds with the school systems in the region is paired with a focused student recruitment plan which is increasing the Dual Enrollment yield from area high schools. The institution is offering regular College information programs to continually update guidance counselors on new degree programs, etc. With the goal of promoting access and shorten time to degree completion, the institution needs to promote Dual Enrollment in all our service counties, and as such, the total enrollment in this program is an important metric for success. With a baseline of 203 students participating in the program during fall 2015, the efforts to strengthen the program have resulted in 304 participants during fall 2016 (a 49.3% increase) and 418 participants during fall 2017 (a 106% increase when compared to the baseline). With the rapid growth of the program, the institution is experiencing challenges that are associated with scalability issues and the capacity of processing more than 400 students through any single process (e.g. communication with individual counselors, collection of participation agreements, financial aid processes, textbook rentals, etc.). This scalability is currently being addressed; the Lead Academic Advisor has now assumed the responsibilities of the administrative oversight of the program and is currently reevaluating processes and procedures in order to find efficiencies, and to develop appropriate documentation for the program. This new oversight structure will give the designated Dual Enrollment Advisor additional time to focus on student support and outreach to the school officials, counselors, and parents. Additionally, with students in the Dual Enrollment program now participating in classes during the summer term, the institution is working closely with local schools to provide all the support necessary during the time where school system personnel may be limited. Enroll most students in need of remediation directly into gateway collegiate courses in English and mathematics, with corequisite Learning Support. This is a key institutional strategy that aligns with CCG’s persistence and progression goal of increasing the likelihood of degree completion by transforming the way that remediation is accomplished, and aligns with Institutional Goal A1. To promote access while at the same time promoting retention, progression, and graduation, it is imperative that the College has an effective structure to support students who arrive at college with a gap in academic preparation. The College needs to shift its focus, however, from traditional remedial education as a standalone enterprise, and concentrate on supporting students in the credit-bearing collegiate level courses that align well with each individual program of study. CCGA has transformed the Learning Support structure by focusing its efforts on corequisite remediation. For mathematics, students that would have been previously placed in MATH 0099 Intermediate Algebra are now enrolled in the gateway mathematics course that is appropriate to their programs of study (i.e., Quantitative Reasoning or College Algebra) while taking the linked support course (corequisite component). The students with a larger gap in preparation (who were previously placed in MATH 0097 Elementary Algebra) are now placed in the Learning Support Foundations course as part of a year‐long pathway. For English, students requiring remediation are now similarly placed in the appropriate collegiate/corequisite English course (ENGL 1101/0999) or the Foundations for English Composition (ENGL 0989). A key element of this initiative has been a shift in focus of what is being considered a measure of success. Traditionally, the success of Learning Support students was evaluated for individual prerequisite courses; it is now clear that success of our remedial structure needs to take into account attrition and its compounding effect when associated with sequences of courses. With this in mind, CCGA’s measure of success for this initiative is the success rate of Learning Support students in collegiate level courses (ENGL 1101, MATH 1001, and Math 1111). The students that are now placed in corequisite remediation would have been traditionally placed in a two-semester sequence of a remedial course followed by a gateway course. The historical success rate through a two-semester sequence like MATH 0099 - MATH 1111 was close to 36% (based on the aggregate data of success rates of first time freshman cohorts for 2009, 2010, 2011, and 2012). After 3 years of at-scale implementation, the new structure continues to be a success; based on LS students from fall 2014 through fall 2016, and with most of the students placed directly into gateway collegiate courses with support, these students are passing ENGL 1101 at a rate of 69.2%, MATH 1001 at a rate of 66.8% and MATH 1111 at a rate of 54.6% (compared to the success rates of 76.4%, 66.9%, and 62.3% respectively for students that are deemed collegiate ready). It is important to note that the rates identified above correspond to the success rate in a single semester of gateway courses paired with corequisite support, while the comparison with the traditional remedial sequence would correspond to the success rate after 2 semesters which would yield success rates around 36%. This is evidence that the students are not only succeeding at higher rates, but they are also shortening the time to graduation. However, this still represents a concern, because the institution now has year-long pathways for students with a larger gap in preparation which would traditionally be in a 3-semester sequence, but are still affected by the compound effect of attrition of a longer sequence when compared to corequisite remediation. Given the great success of corequisite remediation, the College needs to ensure that it places as many students directly in collegiate level courses with support. This prompted the reevaluation of placement thresholds for the English Placement Index (EPI) and new thresholds will be implemented by spring 2018. 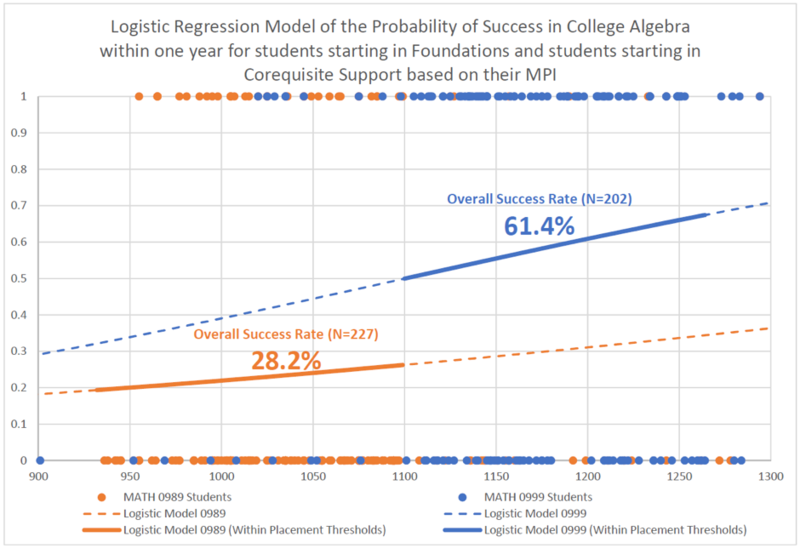 Additionally, the institution is currently performing a logistic regression analysis of the probability of success of the students starting in Foundations courses vs students starting in corequisite support based on their Math Placement Index (MPI) and EPI. Preliminary results show that the students that start in corequisite support have a substantially higher probability of success in the gateway courses than their foundations counterparts, and that there is a regression discontinuity at the point of the institutionally selected thresholds that separate the Corequisite and the Foundations students. This regression discontinuity indicates that the large drop in the probability of success is attributed to the remedial course structure and not to the academic achievement represented by the placement index. The following graph is a preliminary result of this study and it depicts this regression discontinuity for the case of students in the College Algebra Pathway (from Fall 2014 to Fall 2016). It is important to note, however, that there is still great reservation among mathematics faculty to completely move away from the foundations courses, as it is not yet clear the impact in subsequent courses beyond the gateway course or the unforeseen impact of including students with a large gap in preparation in the gateway courses. The analysis will continue. This strategy is supported by Affordable Learning Georgia, and aligns with CCG’s goals to Increase Access for underserved and/or priority communities, and to Restructure instructional delivery to support educational excellence and student success, and aligns with Institutional Goal A1. With the goal of promoting access and affordability of higher education, the College is committed to adopting open and low-cost educational resources as alternatives to high price textbooks, without compromising the standards of the courses. With the support of Affordable Learning Georgia, and with institutional support from faculty and administration, the College has now adopted open or low-cost educational resources in 12 common courses in the general education curriculum. To further encourage and support the evaluation of new OER alternatives, the Office of Academic Affairs has launched an OER Reviewer initiative, where faculty members receive a small stipend to engage in additional review of OERs. After receiving the first at-scale Affordable Learning Georgia grant, CCGA students started saving $312,000 per year. Since this first ALG grant, which transformed College Algebra, Trigonometry, Precalculus, and Probability and Statistics to adopt low cost educational resources, the institution has transformed Principles of Macroeconomics, Principles of Microeconomics, Introduction to Psychology, Introduction to Sociology, Principles of Chemistry I and II, and Organic Chemistry I and II. During the 2016-2017 academic year, this strategy has resulted in more than $600,000 in student savings. The College of Coastal Georgia continues to grow and evolve as an institution, with an expanding set of baccalaureate programs, and with a strong enrollment growth trajectory. The framework and structure provided by Complete College Georgia, is something that the institution fully embraces and that is used to guide the completion efforts through this institutional development. The creation of the Complete College CCGA Task Force this past academic year was the ratification of the institutional commitment to align our completion strategic goals to those of the state. A retrospective look at the past five years of reports shows that while the strategies shown above have been selected because of their priority or impact, the College of Coastal Georgia continues to work in several additional completion strategies that were identified in previous academic years and that continue to be successful. These strategies include 1) providing adult learners and military students/veterans with tools and resources needed to succeed; 2) promoting the Bachelor of Science in Interdisciplinary Studies degree; 3) offering a mandatory academic intervention workshop for all students issued either an academic warning or placed on academic probation; 4) providing intrusive advising to keep students on track to graduate; and 5) implementing a comprehensive student employment program. While some of these strategies have grown organically from identified institutional needs, some of them have been the result of the self-assessment motivated and facilitated by CCG campaigns and events like those around the Beyond Financial Aid instrument from the Lumina Foundation. For CCGA, one of the most important reflections from this self-assessment was the fact that while many of these strategies were being implemented concurrently, the institution needed to improve the internal communication regarding all the institutional high impact strategies and activities aimed at increasing retention, progression, and graduation rates. After the identification of this challenge, the institution is taking a more concerted approach to completion; with quarterly Task Force meetings and biweekly Enrollment Committee meetings, the institution is nimbler to connect efforts strategically and to disseminate the information to the different units across campus. Looking ahead, the institution is eager to deploy and evaluate additional strategies that started taking shape during the 2016-2017 academic year, like the implementation of structured schedules and four-year program maps. Through the creation of highly structured four-year Program Maps that guide students on what courses to take every semester in order to graduate in four years; the celebration of important milestones in the educational experience which promote timely progression; and proactive and intrusive advising, the College is ensuring that students stay on track to on-time graduation. The retention and progression priority is embedded in everything the College is engaged in, including performance reviews, annual reports, and budget reviews. The focus is to create a learning-centered environment for traditional, adult, first-generation, and military/veteran students that will increase student learning, promote student progression and, ultimately, lead to improved graduation rates. The College believes its student progression metrics, standards, and retention/graduation strategies are clear evidence of those expectations and a strong foundational commitment to growing enrollment and focusing on graduation with distinction as the overarching campus priorities. Based on USG Preliminary Student Enrollment Report data for fall 2017.